Whether it is insurance premiums or MOT tests, winter tyres come with a set of pros and cons, but what are they? The Institute of Advanced Motorists (IAM) explains. IAM chief examiner Peter Rodger, said: "In countries where severe winter weather conditions are more or less guaranteed, it is quite normal for drivers to switch to winter tyres for the duration of the cold season. "This practice has not been commonly taken up in the UK because harsh winters are fairly unusual, despite experience to the contrary over the last two years. "There are four options available in the UK: winter tyres, all-season tyres, snow chains and snow socks. "None of these are considered alterations to a car so shouldn't affect your insurance premium, although it is a good idea to make your insurance provider aware." Winter tyres have a different tread pattern of wider grooves and narrow slits at the edges of the tread area, which combine to give better grip on snow and ice. The second difference is the material the tyre is made of. The rubber used for the tread section on standard tyres gets stiffer as the temperature drops, and grip starts to reduce below seven degrees Celsius. 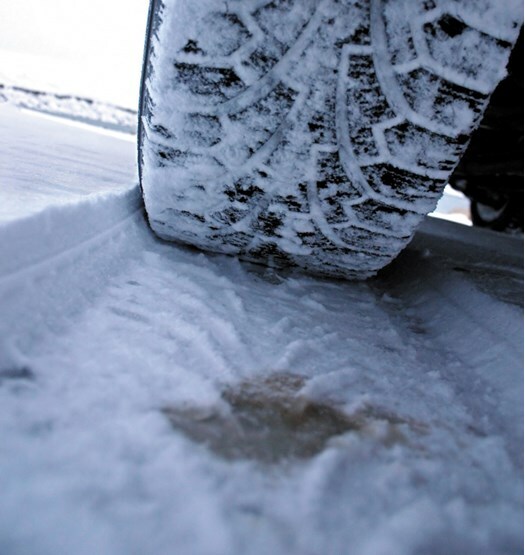 Winter tyres use a different material which stays soft and grippy to well below zero. Tyres made with this rubber will carry either a snowflake or a mountain as a symbol on the sidewall. Winter tyres will not cause a car to fail the MOT test, however they do have drawbacks in terms of storage and cost. Most European drivers who make the switch to winter rubber have two sets of wheels and tyres so that they can change over easily. However even getting steel wheels for the winter, instead of the alloys the car comes with, will cost the owner upwards of £500. Changing to winter tyres permanently is an option, but is unadvisable as winter tyres have less grip once the weather warms up, will wear out more quickly and the car will use more fuel. A compromise solution available to drivers who want some extra grip for the winter, but don't want the expense or inconvenience of two sets of wheels is to fit a set of all-season tyres. As a result of the rubber compound used and tread they can be used all year round as the name implies, but like any compromise they will not be as good as standard tyres in summer or winter tyres in snow and ice. Because they use the same rubber compound as winter tyres, they should have the snowflake or mountain symbol, but may also have a sun symbol or be marked "M+S" (Mud and Snow). An alternative to changing tyres is to carry snow chains or snow socks to fit when the snow gets deep. Snow socks are a relatively recent innovation; made of a strong fabric which grips snow, they stretch to fit over the tyre. Either of these can be used with standard tyres and they fit quite easily into a corner of the boot, or garage in summer. Snow chains are more effective than socks, but do have a few drawbacks. Chains increase the width of the tyre and may affect the suspension, ABS brakes, or wheel arch on a turn, but the owner's handbook or a dealer will be able to tell you if chains can be fitted. They can also be a chore to fit and anyone buying them should practice fitting them before the bad weather sets in. Driving with snow chains on a clear road surface could cause damage, and be an offence, so you mustn't fit them until there is a blanket of snow and you must stop as soon as the snow has gone and remove them. Expect to pay around £50 for a set of economy chains to carry in the boot for emergencies, and up to a couple of hundred pounds for a heavy duty set suitable for regular use. Snow socks, on the other hand, are slightly cheaper to buy - typically about £40 upwards (correct at time of publication) - they are much easier to fit and will give sufficient grip for most snowy conditions in the UK. They do not damage roads, although they will wear out very quickly if driven for any distance on tarmac, so should be removed as soon as it is safe to do so. Both chains and socks should be washed as soon as is practical after use to get rid of dirt and salt that will otherwise corrode them. Mr Rodger continued: "With extremes of cold weather being unusual here, and the UK government showing no signs of making winter tyres compulsory, there is no obligation to invest in them. "Nevertheless, a set of winter tyres could be a sensible option for some UK motorists, for example those who live at high altitude or in remote areas. "For the rest of us, whether the cost is justified depends on individual circumstances such as annual mileage and whether you have the option to avoid driving in extreme conditions." I currently have newish winter tyres on the front of my vehicle & summer tyres on the rear, which I am about to replace. If I letf the winter tyres on the front & all weather/summer on the back, would it matter - for all year-round motoring? Alternatively, would I be better to switching the winter tyres to the rear & putting new all weather on the front( front wheel drive). Some people advise buying two winter tyres and putting them on the driven axle. I suspect that this is dangerous. Please advise. I use Winter tyres Dec Jan Feb all terain rest of year on my 4x4 and have never had a problem got stuck or slid off the road the choice is yours! Just fitted Nokian winter tyres to my Mazda Sport and I can already feel the difference, and that's in the Mid UK. The car is grippy anyway, but these are very stable and not moved out of line at all on wet roads. Steering feels just one notch lighter but then it is a new set of tyres all around and maybe any new tyres would have felt different. Feel equipped for the winter! In answer to the guy below posted a year ago, but you should not mix summer and winter tyres. It upsets the dynamics of the car and the electronics, abs, stability etc and I don't think the insurance would be happy. I've read it's easier to spin your car etc. at this stage I'd definitely recommend winter tyres if you can afford it, but getting a good set isn't easy. My tyres are slightly uncommon size and not only that, your big tyre chain dealers are expensive and lacking in many brands and varieties. I won't advertise but I ordered what I wanted online and took the tyres for fitting at about a tenner a corner. The tyres online were not available anywhere locally, they only do cheap brands but I got my Nokians (very well regarded) at about 40% less than lesser quality tyres and that's imported from Germany in a few days. @Mo - Two questions, please - did you change to steel wheels as mentioned in the article and also I'd be interested to know where people store their tyres. Our local garage will apparently store customers' normal tyres and their winter ones, depending on the time of year, though I don't yet know the cost. Tyres for two cars in the household take up a fair bit of space. I use snow socks in heavy snow, which I got from Asda for £20 last Spring when they were reduced. They take 30 seconds to fit. And if you visit a Mainland European state where it is illegal to use winter tyres in summer? probably spain, portugal? it is, however, illegal, to drive car in summer tyres anywhere to the east or north to France/Germany border. It is even RECOMMENDED in Italy.